I’ve been craving homemade chocolate chip cookies and thought why not turn my craving into a fun, after school activity for Lyla and I to do together? Then I got to thinking and realized we’ve made it through one month of Kindergarten and its been great. 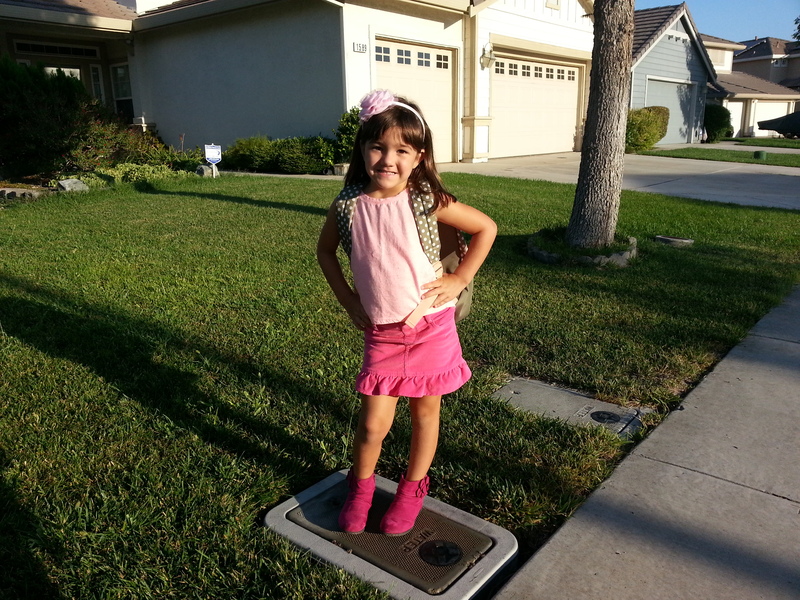 Lyla loves going to school, loves learning and loves making new friends. I knew we would have extra cookies and I thought it would be nice to share some with her teacher to show her just how much we appreciate her hard work. 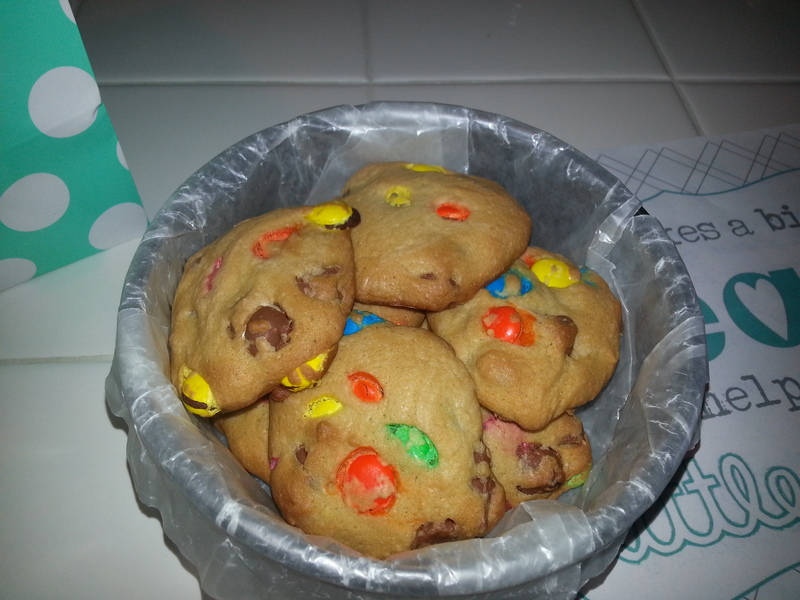 I put the cookies in a Tupperware container we had at home, found a great free printable online, wrote a nice message on the back and packaged it up in a cute, teal polka-dot bag. I wanted the printable to be tag-sized so I could punch a hole in the side and tie it to the handles on the bag but my hubby printed it large so I had to work with what I had. 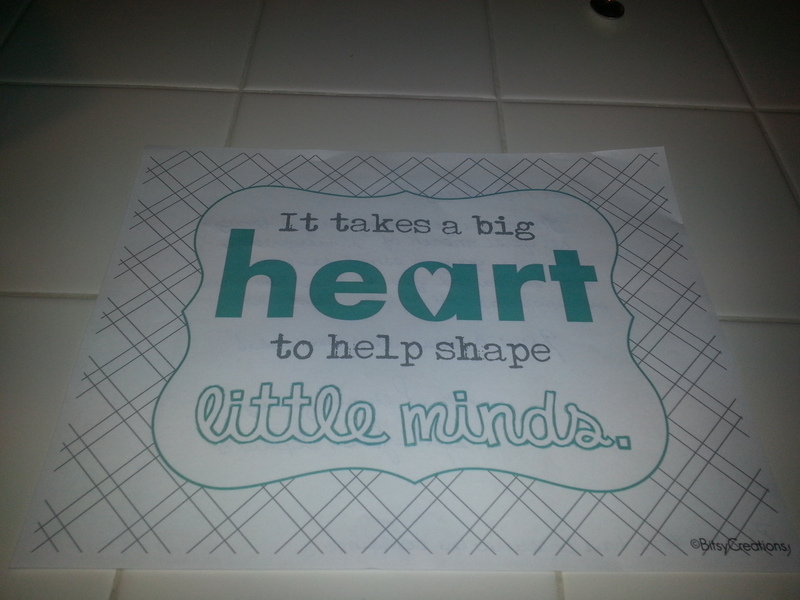 In the end, what really matters is that Lyla’s teacher feel appreciated. I love holidays, I just love them, each and every single one. And the 4th is no exception. 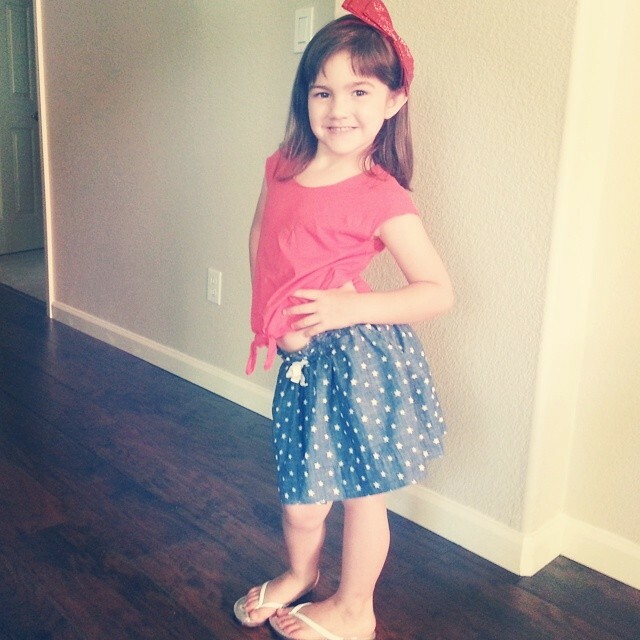 I love to decorate with stars and stripes and of course, dress up in cute 4th of July outfits. I love to hang out with family, drink wine and eat good food and that is exactly what you do on the 4th. AND my stepsister’s birthday is on the 4th, how cool is that? This year we got to celebrate in our new hometown. That week, someone in the neighborhood left a flyer on our door for a street party. It said to bring your grills and chairs out front, and of course your fireworks! After living in San Jose for so long where fireworks are banned (except for those used in the big fireworks shows), this was a big deal. 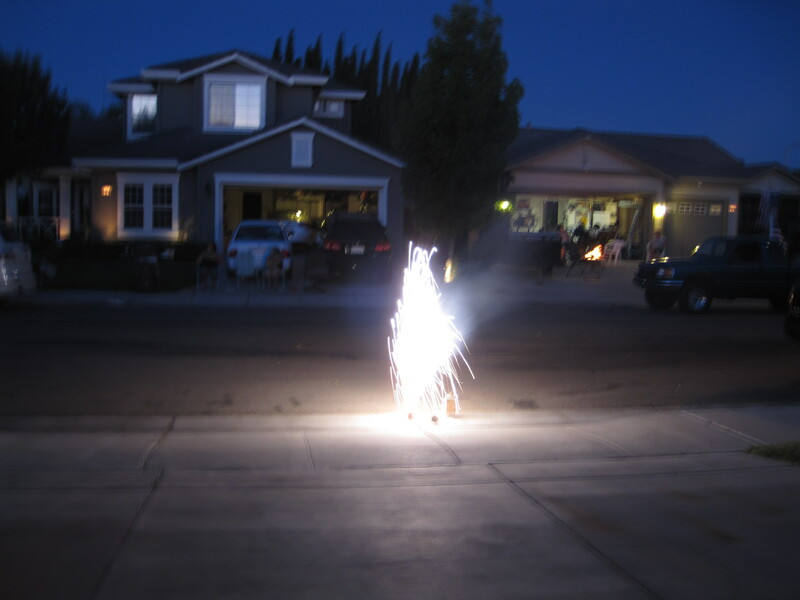 Growing up, we always celebrated the 4th on the street in front of our house, setting off fireworks. I was so excited for my girls to experience a bit of a small town 4th of July celebration and I myself absolutely adore little neighborhood celebrations. I love a sense of community. We invited my parents to come up and join us for some good, old fashioned family fun. One of the best parts of being a girl mom is dressing up my two little angels. Each holiday, I get so excited to find great outfits for them wear. Both girls took a nap this day (its a pretty amazing feat when both girls sleep at the same time) and Sophie woke up first. 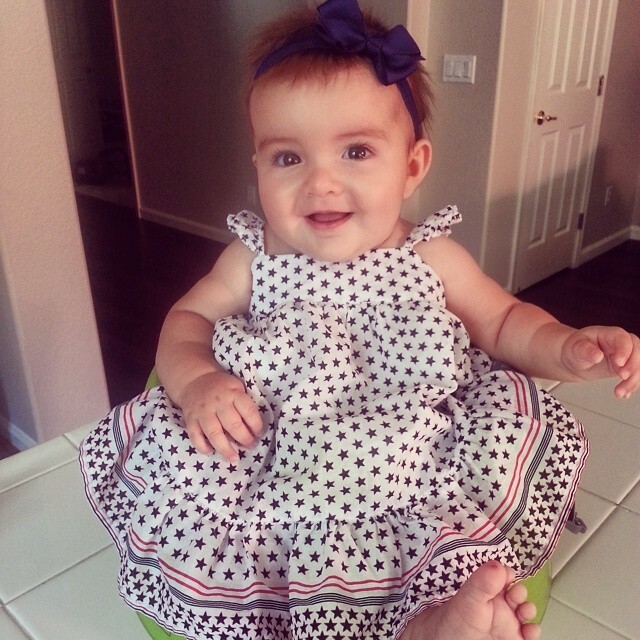 I couldn’t wait to get her in her star spangled dress. She is such a doll! Lyla woke up not much later and I quickly got her ready. I just loved this outfit on her. It’s one of my favorite 4th of July outfits by far. Typically, I forgo matching outfits for coordinating ones. And these two outfits looked great together. And you’d think I would have gotten a picture of the two of them together, right?? Well I was too busy running around trying to get everything ready for the day and forgot #momfail. In the past, when we were still a family of three, I would have one of us wear red, one white and one blue on the 4th (my hubby is usually a very good sport and will whatever I pick for him). This makes for such cute pictures. Since we are now a family of four the whole, red, white and blue idea doesn’t really work so this year I got to play with prints and patterns for the girls. I was too tired and overwhelmed from moving to try and get my hubby to play along so I flew solo on the 4th of July coordination. I wanted something simple yet cute and comfortable for myself. I got the best pair of Joe’s jean shorts earlier this Summer and knew that is what I wanted to wear on the 4th. I picked up the blue tank that week at the mall and paired it with my red star headband. 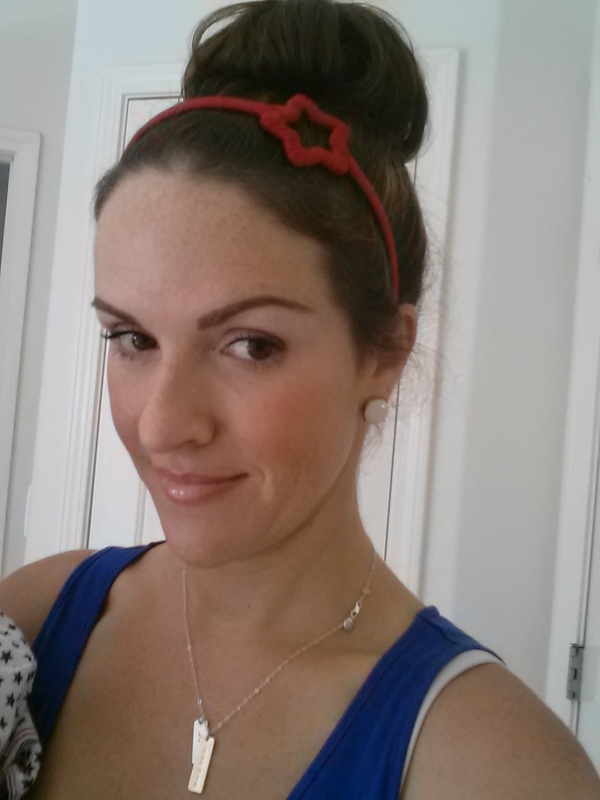 This headband was a complete impulse purchase but it has worked perfectly for other 4th of July outfits years past. I completed the look with a sock bun, my white Kate Spade knock-off studs (thank you Nordstrom Rack!) and my Lyla & Sophie nameplate necklace. Simple, cute, comfortable. Since we just moved in the last weekend and had a BIG issue getting all of our stuff (I’ll have to dedicate a post to our move, it was the hardest by far), our house was pretty sparse in terms of furniture, etc. But that didn’t stop us from having fun. 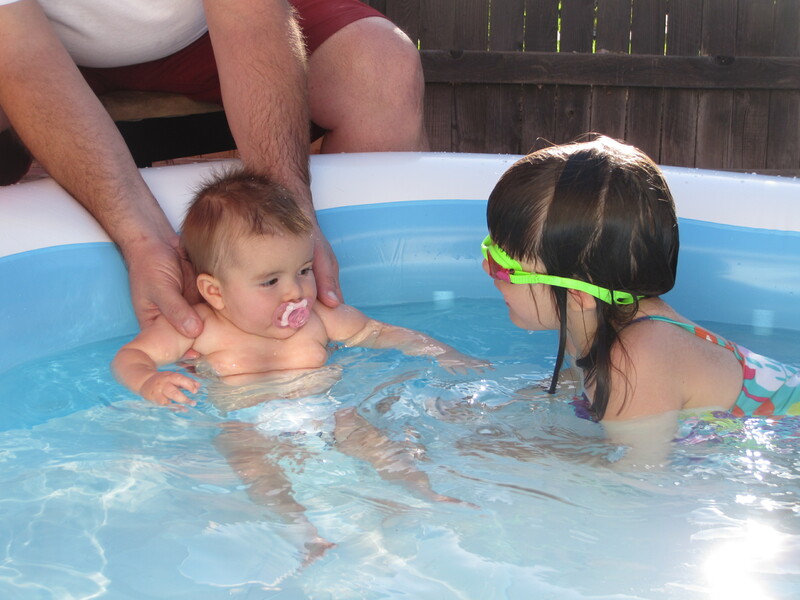 We bought a blow-up pool at Walmart that week and Lyla was just dying to use it. We had a blast hanging out, watching her play in the water. Sophie enjoyed it as well. I’m bummed we didn’t take more pictures of family this day (I’m usually snapping away all day – I love to take pics!) but again, I was so tired from moving just a week earlier that I let it go. I enjoyed the day with my girls, my parents and my hubby. We met our lovely neighbors from across the street and you’ll never believe where they used to live, Orlando! What a small world. That is right near where I grew up and went to college, crazy!! It was a great, great 4th complete with FIREWORKS! Although, Lyla Rae is scared of loud noises and hates fireworks so when they really started to go off, she couldn’t deal and had to stay inside, #storyofmylife. Pink courdoroy skirt: GapKids, Peach die tank: GapKids, Denim fitted shirt: Tucker + Tate (via Nordstrom), headband: Gymboree, pink booties: BOC Born O Concept Kids (via Marshalls). I had to get a close-up of her headband. This picture does not do it justice. It is so pretty! We picked it up from Gymboree yesterday for $1.92! It was already on clearance and with the additional mark downs it brought it down to just under two dollars. That made it that much cuter, I just love a good deal. Her booties are another favorite of mine. 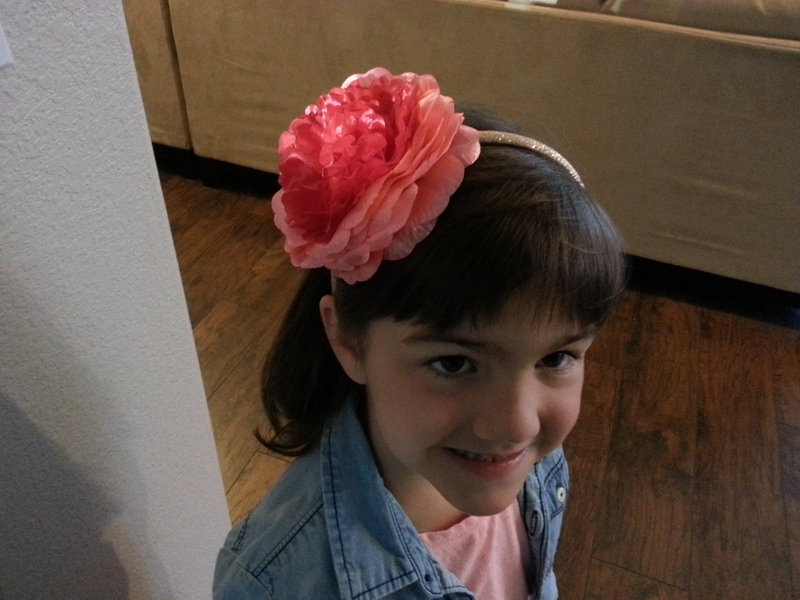 I love the pink color and flower detail, plus they are made by Born so they are super comfortable. Lyla loves to wear them year round and because they are booties, she can even when its pretty warm outside. I love them! Once we got out the door, Lyla took off the denim shirt and changed her headband (she put the other one in her backpack to take to school just in case she wanted to change back – she is SO my child). Lately, its been pretty cool for our morning walk to school but today it was already warming up. All I was thinking about before bed on Saturday was my run on Sunday morning. I.love.to.run. It is my therapy and my favorite form of exercise. I’m going to devote an entire post to my love running one of these days. That is just how much I love it. And Sunday runs are that much sweeter since I get to do them ALONE. I love my babies through and through but there is nothing like running alone to get me centered and ready for a busy week. Needless to say, I was anxious to get to bed on Saturday night so I could enjoy my very rare “me” time on Sunday morning. As I was getting ready, my hubby informed me there was an earthquake that morning! Around 3am, there was a 6.0 quake in South Napa. We did not feel a thing and we are just under two hours from Napa. We were texting with my brother who lives in L.A. asking if we were okay and watching the devastation on the news. There hasn’t been a quake that big since the Loma Prieta quake in 89. An interesting fact, the home my parents live in now was flattened in that quake (they were not living there at the time, we were still in Florida). Not sure if that is interesting or scary but when it was rebuilt they put in major earthquake protection and that fact always makes me feel better. As a native Floridian, earthquakes scare me big time. Just the thought of the earth moving and shaking is unreal to me. I have felt about five or six quakes since I have lived here and they still scare me. The worst was when I was working for Acer. Their offices were on the 15th floor in downtown San Jose and the quake made the building sway. My hubby always says they are fun, must be a California thing. My heart goes out to Napa. It is a region that we absolutely LOVE. We got there once or more a year to wine taste and enjoy the beautiful scenery and it makes me so sad they have to go through this. We even have a little “Black Friday” wine tasting tradition we do every year and have celebrated countless birthdays, anniversaries and just amazing times there. 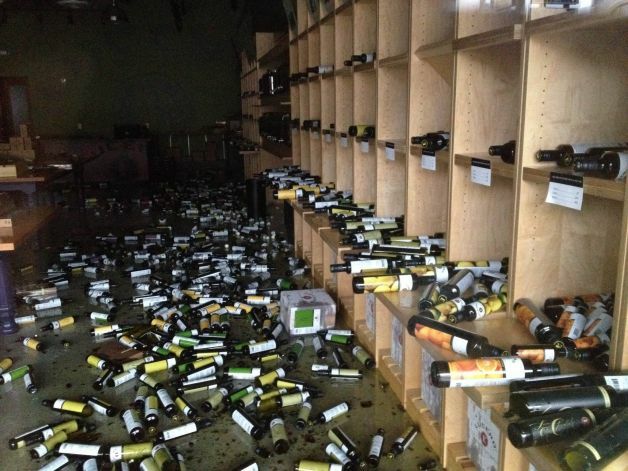 Seeing the pictures of all the lost wine is heartbreaking. Not because we can’t drink it, although that is a bummer, but because I’m sure the winemakers who poured their heart and soul into the wine are devastated. Winemaking is such an art and I hope and pray all the people affected by this tragedy recover well. So with a heavy heart, I got moving. 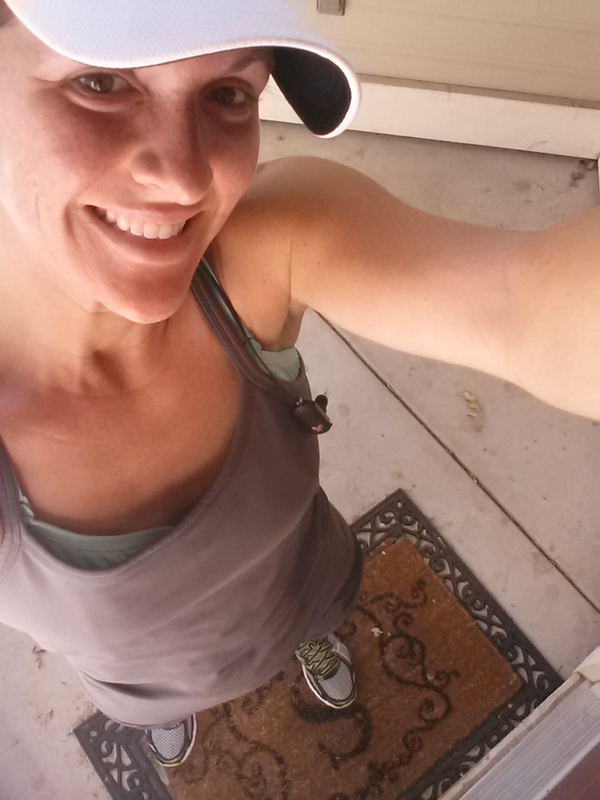 This is me all sweaty and happy after a glorious three-mile run. Some runs are better than others but this one was great. Pandora played all my favorite songs to keep me moving and the weather was warm but not stifling. And my headphones were charged, yay! Most of the time, I usually forget to charge them and don’t realize it until its too late. These headphones are the jam by the way. I have tiny ears and have had an issue with getting headphones to fit my entire life but my hubby changed all that when he got me these headphones for Christmas one year. They are Bluetooth and they stay in my ear for my entire run. It is a huge pet peeve of mine to have to mess with my headphones during my run, it takes me out of the zone. After showers and breakfast, Toys R Us was next on the agenda. Lyla received a gift card from her Uncle Jon and was desperate to use it. 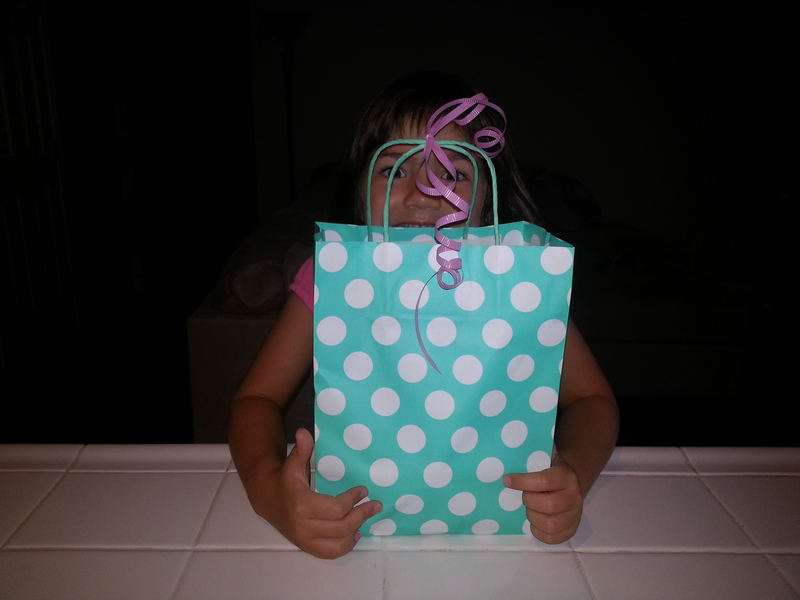 This little girl loves to shop (she is my mini-me after all) and this card was burning a hole in her pocket. We decided to head to the Toys R Us in Dublin since there are none in Tracy, much to my daughter’s dismay. Lyla likes to take her time and look at everything before making a decision. 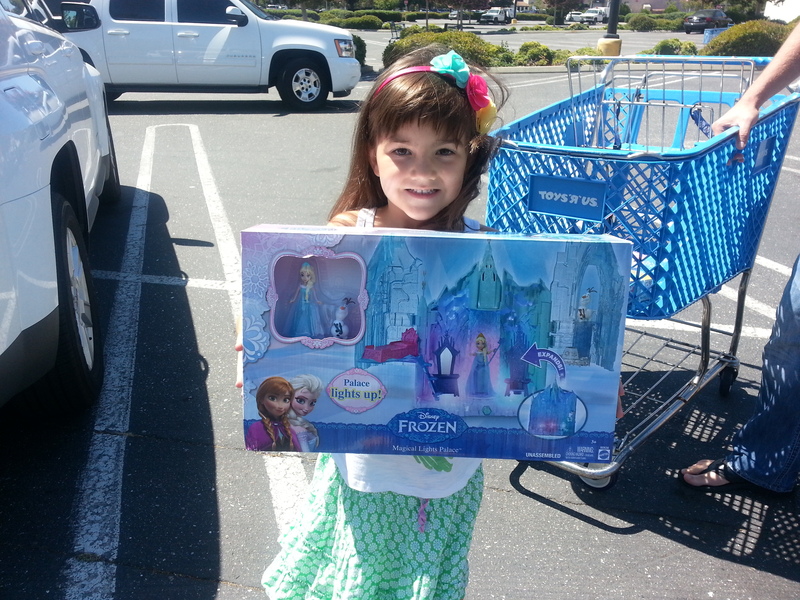 In the end, she ended up with a Frozen light-up castle, Frozen dress-up shoes and a Frozen charm bracelet. She was a happy girl!! By this time, my hubby was ready to get back home, back to the Niner game and back to relaxing. We’ve been busier than ever this summer and this was one of our first weekends where we had nothing specifically planned, that is pretty rare for us. We got home, ate lunch, watched the game and relaxed, it was perfect. Soph went down for a nap so I decided to go to the grocery store. 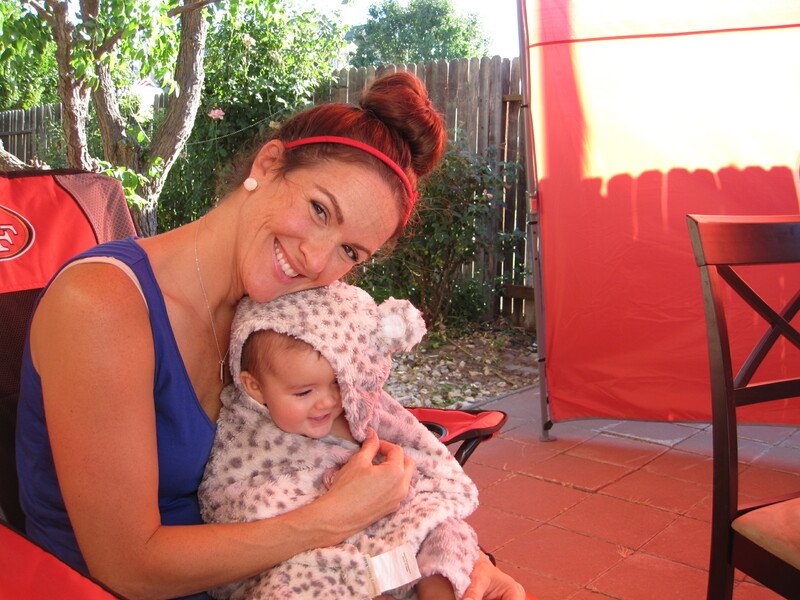 Lyla came along with me and we got some rare, mommy and Lyla quality time. It was so nice. Even though it was just a trip to the grocery store, it was still so special. I love this girl so much. I hoped you enjoyed this look at our Sunday!! If I could describe our life lately in one word it would be chaotic. But in all of the chaos, there has been so much good. We are finally getting settled into our new home and we are loving our new town. We celebrated many family members birthdays including our own Lyla Pies. She turned five the day before she started Kindergarten (I’ll be doing a birthday post here soon). I must admit, I had a little meltdown the day before. It’s got to be the most bittersweet feeling in the world. 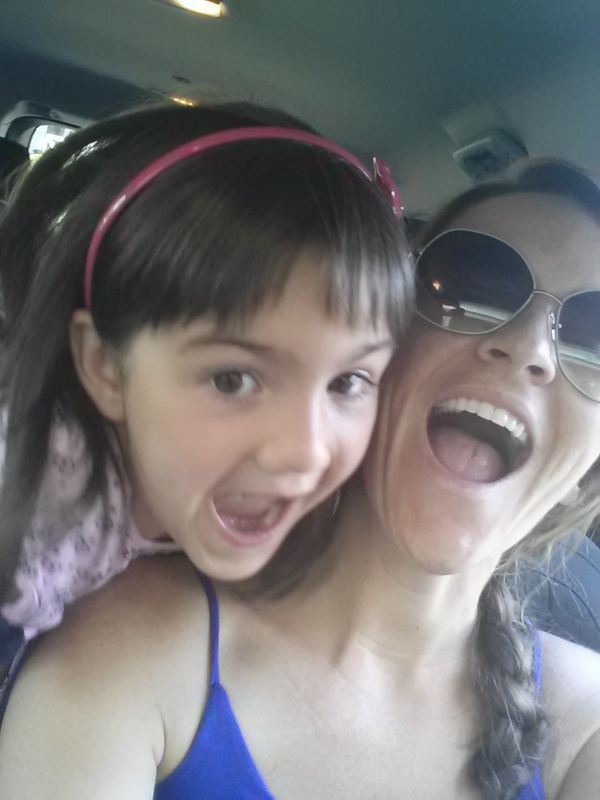 Although I am happy to report she is doing amazing and thriving, and we love her teacher. I’ve even turned in an application to volunteer in her classroom. Before I had kids, these are the kinds of things I always dreamed of being able to do and now I can do it, its just so surreal to me at times. I hope to be able to get on a regular blogging schedule here soon. I’d love to delve more into meal planning (something I love and do every week), my exercise routine (this is a huge part of my life, I LOVE to workout! ), my diet and what we eat on a regular basis (it’s pretty healthy during the week but we tend to relax more on the weekends, I have a major sweet tooth! 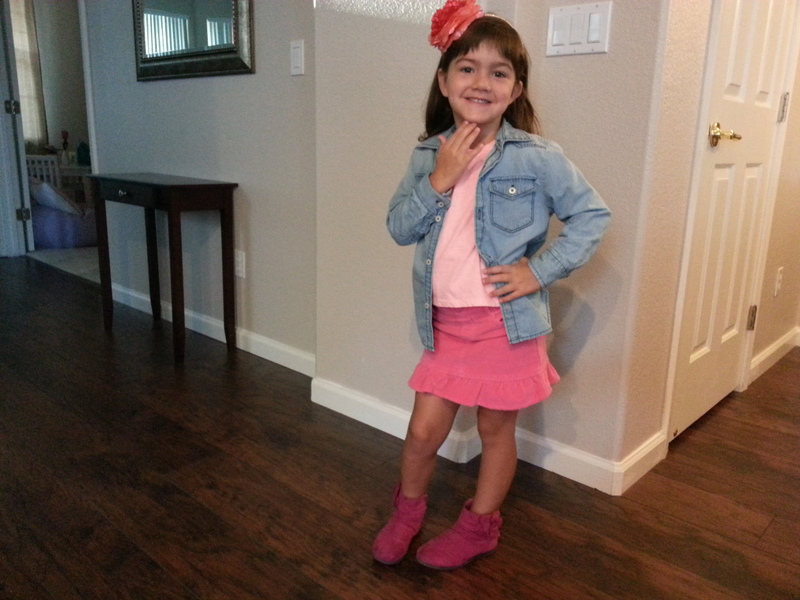 ), my girls clothing – I am majorly into clothes and fashion and let me tell you, buying clothes for little girls is ten times better than buying them for myself. These are just a few of the areas I hope to highlight very soon. We are slowing starting to get a schedule down (something I thrive on) and figuring out life now that we have a Kindergartner.